The Pacific Northwest's watery highway is heading toward a standstill. But as barge companies and wheat producers prepare for lean times, The Dalles stands to make economic gains with an influx of workers. In five days, one of the most vital components of the Pacific Northwest's transportation system will become deftly quiet. And inoperable. According to U.S Army Corps of Engineers spokesman Scott Clemans, the lock navigation systems at The Dalles, John Day and Lower Monumental dams will all shut down for repairs until mid-March, effectively stopping barge traffic up and down the Columbia River. An estimated one million bushels of wheat pass through the locks every day, but the wheat industry has known about the construction for two years, and is well-prepared to use alternate modes of transportation, Oregon State University Agricultural agent Sandy Macnab said. "Most of the grain companies have been planning to load all the barges, and will have nine million bushels of wheat ready to load or store in The Dalles," Macnab said. "It shouldn't be very interruptive." Mid-Columbia Producers Manager Jeff Kaser said the new grain storage bins were built for a variety of reasons, including to compensate for an increasing and inevitable glut of wheat shipping out of The Dalles after the Dec. 10 navigation lock closure. Typically, Mid-Columbia Producers ships eight to 10 barge loads a year. This year, however, it has already contracted for 34 barges, Kaser said. The new silo was built to handle the typical wheat production in Wasco County, but the lock closure could present lucrative opportunities for Mid-Columbia Producers. "It helps to have that extra space to ship wheat when the dams close," he said. "It should be positive for our business. It should provide other opportunities because of the higher cost of freight with rail than barge so we see opportunities." 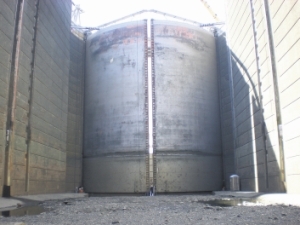 Upriver producers plan on using The Dalles country grain bin during the dam closure. "We will be loading a lot more during that window out of one facility instead of two so we will need quite a few more barges during that time," he said. Barges will come up from Portland, through Bonneville Dam and on to The Dalles in January or February, before Bonneville shuts down for two weeks for its annual maintenance closure. Pacific Northwest Waterways Association, which represents 100 transportation and energy organizations at the federal level in northern Idaho, Oregon, Washington and northern California, continues to work with the Corps of Engineers, wheat producers and overseas buyers to help facilitate a strategy to keep the supply chain intact during the lock repair projects. Kristen Meira of the waterways association said the availability of federal stimulus funds sent the project into motion. "The stimulus funding is a tremendous federal investment in our river system," Meira said. Bernert Barge Lines, which has a maintenance facility in The Dalles, is a small barge company that employs nearly 30. Currently the company operates three tug boats on the Columbia River. Dane Christensen, The Dalles facility manager, said his company will face challenges with the lock closures. "We have a lot to do at the dock facility and do some catching up on maintenance but we will have to layoff about half our workforce," Christensen said. That means 16 or 18 people will be out of work during the lock navigation maintenance project. "It's going to affect the company because of the loss of revenue for three months and we have large expenditures so it will make things a little tight," he said. Even as layoffs loom, Christensen said a possible positive counter action would be lock construction crews staying in local hotels and spending money locally. When the lock work is complete, Christensen said they will rehire its laid-off employees and start to try to catch up. The contract for the repair work was awarded to Dix Corporation from Spokane. Work on The Dalles Dam will cost a total of $15.6 million, while work at John Day Dam is estimated at $14 million. An additional $15.5 million will pay for work at Lower Monumental Dam on the Snake River. The total cost for all three projects is $45.1 million. Dix also won the contract for the gate replacement at Lower Monumental Dam, and Advanced American Construction of Portland obtained the contract for the John Day gate. The gates for the project were built by Thompson Metal Fabrication out of Vancouver, Wash. The gates will be barged upriver to their respective dams for installation. Rob Rich, director of administration for Shaver Transportation Company said he expects one third of Shaver's 60 employees to be laid off. "We are fortunate enough to have a business line that will help sustain us during this outage," Rich said. "Our other work is ship assists in the lower Columbia." Approximately half of Shaver's business takes place above The Dalles Dam, he said. "Our barge fleet will be idled but we've had two years to prepare for this so we have curtailed expenses to conserve operating capital to use during the closure," he said. Like other barge companies that rely on the navigational lock system, Shaver also plans to use the closure to make repairs and perform maintenance. "It's a good opportunity for us to repower one of our tugs," he said. An old engine in one of its tugs will be replaced with a cleaner-burning, more efficient diesel engine. "We are looking forward to the completion to make it a safe and trouble-free system once again," he said. When the locks do open once again, Rich said he expects it to be a boon. "The pent up demand for grain transport will be significant and the vast majority of wheat is moved only by barge, and so the wheat that remains will come downriver. There will be revenue impacts during the closure but the grain will flow again, and it will be coming down by barge," Rich said.